Valtteri Bottas is plotting a night with “10 pints of beer” after his tyre blew when he ran over debris, robbing him of the Azerbaijan GP win. 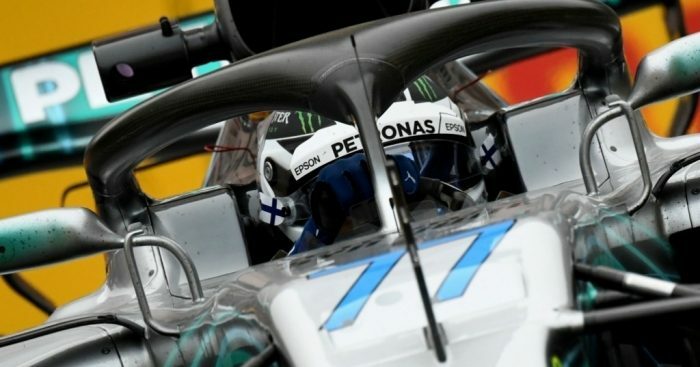 Bottas and Mercedes played the perfect waiting game in Baku on Sunday as the Finn ran a long first stint in the hope of a Safety Car. That materialised when the Red Bull team-mates collided, handing Bottas the opportunity to pit and re-emerge in the lead. A perfect restart after the Safety Car and Bottas was on course for the victory. However, that ended when he ran over a chunk of debris, puncturing his tyre. “Oh my god! It just blew up on me,” he said as he retired his W09. A disappointed Bottas reckons “maybe” he’ll feel a bit better after a couple of pints. “It is difficult to say anything. Everyone saw what happened. It’s just unfortunate, unlucky,” he said facing the media with dark sunglasses. “I’ll maybe have 10 pints of beer and be fine. “I’ll get through it, it’s part of racing but at the moment it’s very painful. “Street circuits are difficult when there are a lot of crashes. “It is always going to be an issue and this time it is just unlucky.